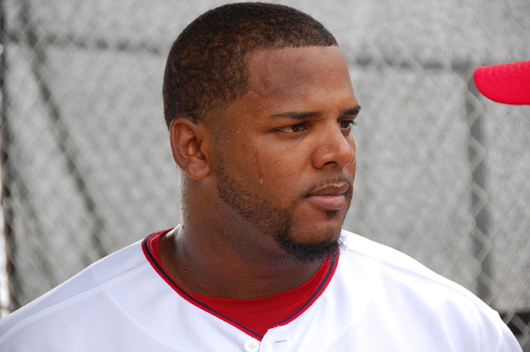 Well, maybe it's just sweat and not a tear, but Wily Mo Pena seems quite distressed now that he's with a losing team, the Washington Nationals. He was known for many great blasts over the Green Monster and onto Lansdown Street during his time with the Red Sox. 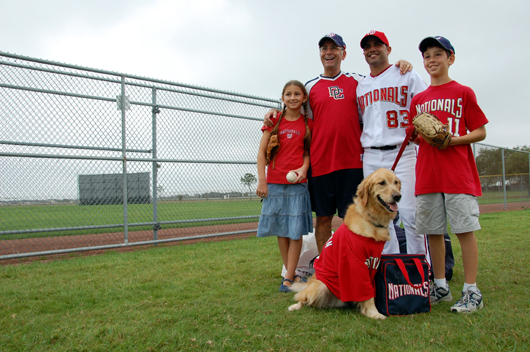 He added his autograph to my Nats baseball. Unfortunately, he smudged another signature with that tear. I mean, sweat. 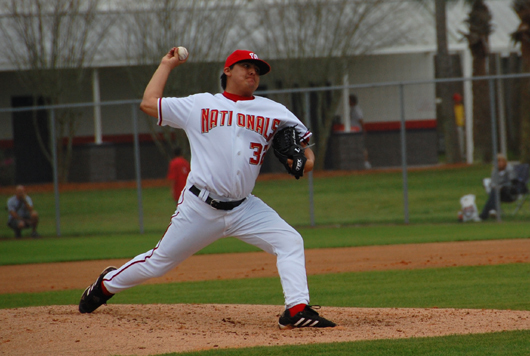 Nonroster invitee and catcher Wil Nieves was definitely the coolest player I've seen so far. Here, he's talking with the local Hernandez family. Nieves is from Puerto Rico, and they were talking en Espaniol quite a bit. The child was quite fascinated with the big guy. Shortstop Christian Guzman walks unsuspectingly away from one of the practice fields, just before I pounced on him for an autograph. It's difficult to get good action shots because I'm not permitted on the field. But here, Chad Cordero throws batting practice. 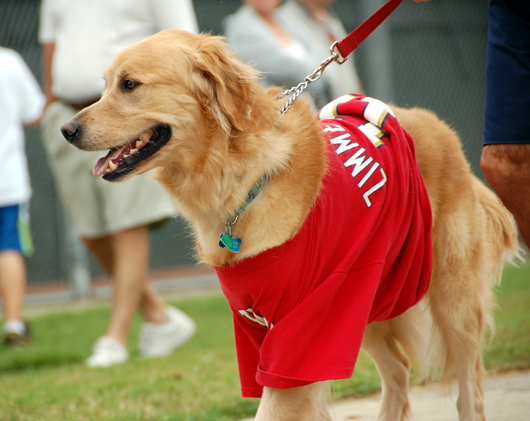 This is Ryan Zimmerman, the Nats' underpaid third baseman. He was quite subdued during practice. He could have ran circles around his teammates, but for some reason, he always let this guy behind him hold him back. I asked him for an autograph, but he just stuck his tongue out at me, then tried to bite the ball. How rude. 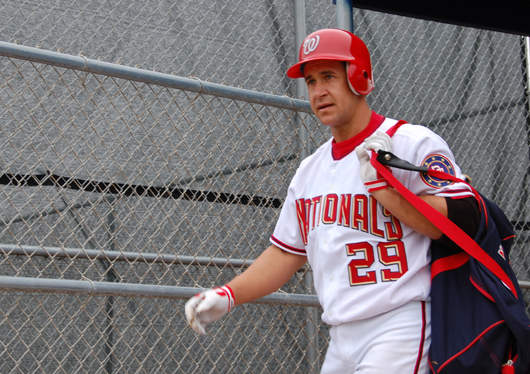 Bret Boone offered some of the most biased impartial observations possible in the 2003 American League Championship, when his brother, third baseman Aaron Boone, blasted the series-winning homer. I swear he and Joe Buck of Fox Sports were secret lovers, too. 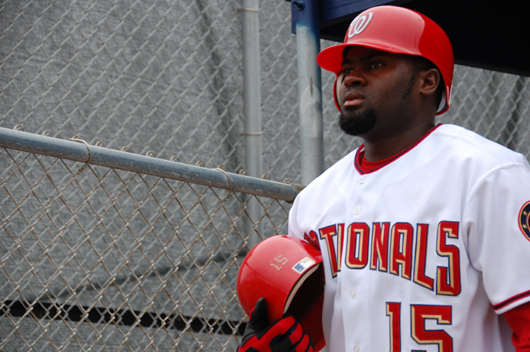 Now, he's back from "retirement," playing with his brother and joining his father, the assistant general manager of the Nationals. Bret Boone brought his family, so I guess Ryan Zimmerman, above in red jersey and brown hair, felt the need to do the same. Here, Zimmerman is with his local family, the Chefers of Satellite Beach. Wil Nieves is standing with them. What a guy.